Topics: Air Fresheners, Awards - Glass, Badges, Bags - Business/conference, Bags - Cotton Shopper, and Bags - Drawstring. 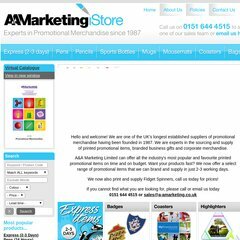 a-amarketing.co.uk Electrical | Corporate Promotional Gifts, Branded Promotional ..
a-amarketing.co.uk Sports and Outdoors | Corporate Promotional Gifts, Branded ..
a-amarketing.co.uk Ceramics | Corporate Promotional Gifts, Branded Promotional ..
a-amarketing.co.uk Bags and Travel | Corporate Promotional Gifts, Branded Promotional ..
On average 1.70 pages are viewed each, by the estimated 21 daily visitors. The programming language environment is PHP/5.3.0. There are 2 Nameservers, ns1.turbodns.co.uk, and ns2.turbodns.co.uk. Dowlis Corporate Solutions Ltd (England, Lancashire) is the location of the Microsoft-IIS/7 server. PING clickpromo.no-ip.org (82.71.235.80) 56(84) bytes of data.